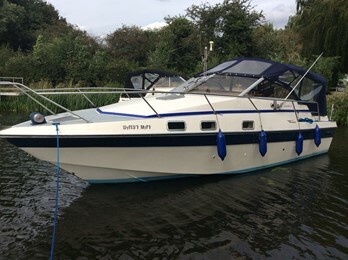 Sunseeker 25 offshore, "Daisy May"
Priced low for a quick sale, this craft would be ideal for a mechanically minded and practical person to finish off the mostly completed extensive works done to the engines, electronics and fuel system. The sunseeker 25 offshore is a striking 80's designed sports cruiser. 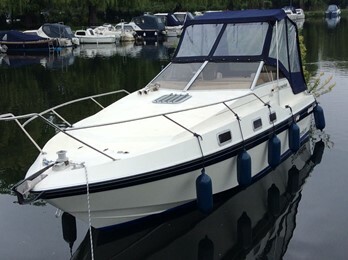 This craft was refitted in 2004 by a previous owner to include engine and drive replacement. Sunseeker International formed out of Poole power boats, and are a UK company based in Poole Dorset. The company is famed for its striking styled sports cruiser originally designed by Don Shead then latterly in house. The company has gone from strength to strength and the product name has become iconic in the marine market. Their latest offerings are in excess of 100ft.